If powdered bicarbonate is being used, Serim GUARDIAN Bicarb pH II Test Strips can be used to test the bicarbonate concentrate once it has been reconstituted. The pH of the bicarbonate solution can also be checked by drawing a sample from the incoming bicarbonate sample port of the hemodialysis machine. To ensure that the pH of the final mixed dialysate proportioned by the dialysis machine is within the proper range, a sample of dialysate can be drawn from the Hansen connector of the sample port connected to the "To Dialyzer" line prior to initiating dialysis. 2. AAMI Standards and Recommended Practices, Dialysis, 2008 Edition, RD52 - Dialysate for hemodialysis, Medical Instrumentation. Arlington, Virginia. 3. Dialysis Therapy, 3rd Edition, pp 71-73, AR Nissenson, RN Fine. Hanley & Belfus, Inc., Philadelphia, PA.
4. Dialysis Therapy, 3 Edition, pg 164, AR Nissenson, RN Fine. Hanley & Belfus, Inc., Philadelphia, PA.
Serim GUARDIAN Bicarb pH II Test Strips will provide an estimate of the dialysate pH without the routine calibration and maintenance required by manual pH meters. Use Serim GUARDIAN Bicarb pH II Test Strips to test the pH of the freshly prepared bicarbonate concentrate as well as the bicarbonate/ acid mixture proportioned by the dialysis machine prior to initiating the dialysis. 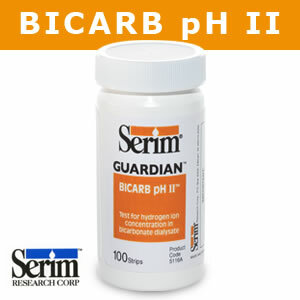 Serim GUARDIAN Bicarb pH II Test Strips are supplied in ready-to-use form. When placed in contact with the sample according to the directions for use (see below), the indicator pad changes color relative to the pH of the solution being tested. Technique Immerse the indicator pad into the sample for 1 second. Immerse the indicator pad into the sample for 1 second. Results For samples at room temperature, wait exactly 10 seconds and then compare the color of the indicator pad to the appropriate color chart on the bottle label. For warmed samples (32°- 40°C), immediately compare the color of the indicator pad to the appropriate color chart on the bottle label. * Use care in obtaining samples. Agitation of the solution will accelerate the generation of carbon dioxide and cause an increase in pH. Store bottles Serim GUARDIAN Bicarb pH II Test Strips at temperatures between 15°- 30°C (59°- 86°F).